Description - Wide Rib Extreme Carpet tiles are a quality indoor/outdoor carpet tile offered at discount prices. UV stable and resistant to mold and mildew growth, these peel and stick carpet tiles are available in several colors that can be mixed and matched to create fun and unique floors or rugs. Easy to install and maintain, these modular carpet tile squares are the perfect alternative to standard carpet and can be easily removed and replaced if one gets damaged. Extreme Ribbed Carpet Tiles are backed by a lifetime warranty and are ‘Eco-Friendly’ with a construction of 100% post-consumer material. Weight - .7 Lbs. per Tile. Recommended Uses - Wide Rib Extreme carpet tile squares have installed in both indoor and outdoor installations and can be found as flooring for outdoor patios, as tradeshow flooring, in basements, as wall carpet, in bedrooms, in offices, on decks, as rugs for living rooms, in family rooms, in kid's rec rooms, in playrooms, in dining rooms, and much more. Mold/mildew resistant and UV stable. If I'm wanting to make a rug out of these carpet tiles, would I need to bind the edges? 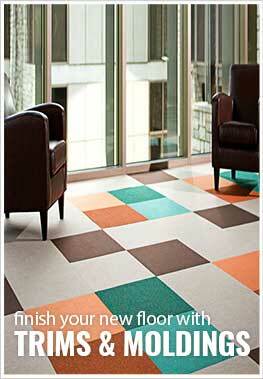 With our Wide Ribbed Carpet Tiles, you would not need to bind the edges to create a custom area rug. I'm laying these on hardwood floors. Can they be used with backing left on? Will the adhesive ruin the hardwood floors? Our Wide Ribbed Carpet Tiles can be placed over hardwood flooring. The adhesive will not stick to the hardwood. Will this stick to Chattahoochee flooring on my outdoor patio? If not, is there something additional I can purchase that will help it stick? Our Wide Ribbed Carpet Tile will more than likely not stick to the Chattahoochie flooring that you have down. We would recommend using our Polyurethane Adhesive or 5900 Adhesive the Chattahoochee to ensure proper adhesion. Will this stick to terrazo flooring? The tiles are peel and stick, they should stick to a clean surface. You may order a sample to test it out first. I want to put this flooring down on top of existing thread-bare indoor/outdoor carpeting. The current carpeting is glued down with glue that contains asbestos and, of course, I would prefer not to disturb it. The floor is concrete. Can this be done? This is not the typical recommended subfloor for peel and stick carpet tiles. Provided the subfloor is clean and flat, it may work. We got it in quick timing and we are very pleased with the outcome of the look of the floor. It is very easy to install and the final appearance looks great. Great and quick service. Looking forward to many years of use. I ordered samples to make a style/color decision. They shipped promptly. After a day or two of making a decision, I ordered the stick-on carpet tiles. Those also shipped promptly. Because of my schedule, I worked on the floor a little bit at a time. The installation was pretty easy (except for cutting out around the toilet). I solved that by making a paper template and then transferring that to the carpet tiles. BIG help! This is not the plushest carpet out there, but I knew that going in (and by the samples), and it was exactly what I wanted for a bathroom. Get yourself a really sharp box cutter/x-acto knife, and a sharp pair of scissors for the fine tuning cuts. Have some "Goo Gone" (or something like it) to clean your blades once in a while... they get gummed up from the adhesive backing. I'm really pleased with this product and FlooringInc.